Plainville police are conducting an administrative review into a police pursuit that ended in a crash in a front yard on East Maple Street. The pursuit ended with a stolen car hitting a utility pole, rolling over at least once and landing in the front yard of 53 East Maple St., right next to the Linden Street School. On Wednesday afternoon, police said they have learned that there was contact between a marked Plainville police cruiser and the stolen car just before the crash. Police have taken three people from that car into custody and said they are suspects in recent burglaries in Plainville and surrounding communities, police said. Three men are in custody, accused of breaking into several cars in Plainville and trying to get away from local police. The chase ended in a front yard on East Maple. It all started when police responded to the condominium complex at 492 East St. at 3:36 a.m. on Wednesday after receiving reports of car break-ins and saw a car veer recklessly out of the parking lot of a separate apartment complex not far from the original location, police said. The driver would not pull over and lost control when he turned onto East Maple Street, where it eventually crashed, police said. All three people who were in the car crawled through the shattered back window and ran off, police said. Police found a 15-year-old walking near the crash site and hours later found another man hiding in some shrubs near the crash site. He was injured, but refused to be transported to the hospital, police said. 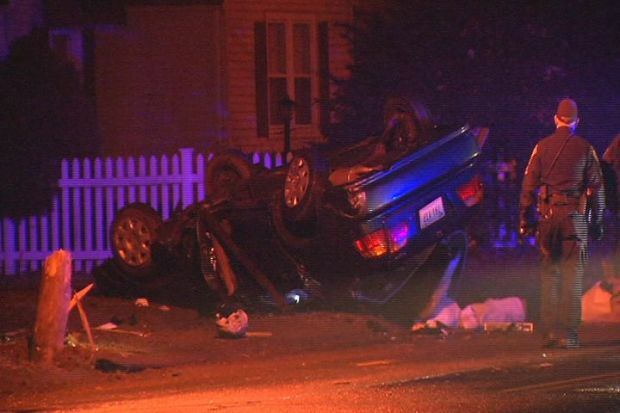 Police found another man later at Hartford Hospital, where he was being treated for injuries sustained in the crash. The car involved, a 1999 Honda Civic, had been reported stolen in Middletown, according to police. Connecticut Light and Power was also at the scene, accessing the power pole that was hit in the crash.